Wow. Gabby really knows how to pick ’em…I never in a million years thought Ethiopian cuisine would be our March theme but I guess that’s how this challenge works. I did more research than I have with the previous countries because when I’m flying entirely blind like I was this month, having never eaten at an Ethiopian restaurant or even known anyone Ethiopian, I wasn’t about to ‘play around’ with flavours. As of last week, the only thing I knew about Ethiopian food was that it was spicy and the stews were eaten using injera. I find, as is the case for many things in life, that you get more out of this challenge, when you put more into it. Merely mimicking the flavours to suit your style of cooking isn’t enough to fully understand the unique ingredients and how they are used within Ethiopian cuisine. So, I’m going to begin with the injera as a starting point. What is it? It’s a fermented flatbread traditionally made using Teff flour. Teff is a tiny grain (there are 3000 grains of teff in one gram!) which grows quickly in less than optimal circumstances (compared to wheat). It’s nutritionally dense; high in protein, calcium, and is gluten free. 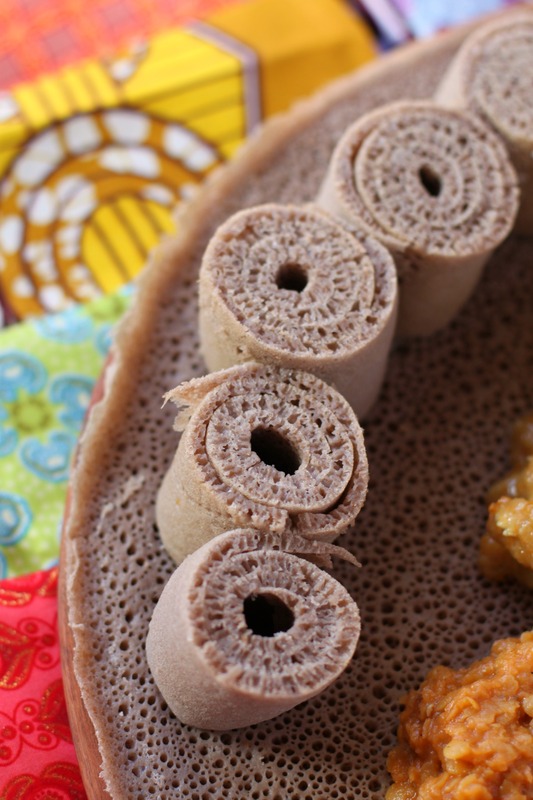 This, along with the nutty flavour, make Teff injera the perfect accompaniment to Ethiopian stews, or wots. 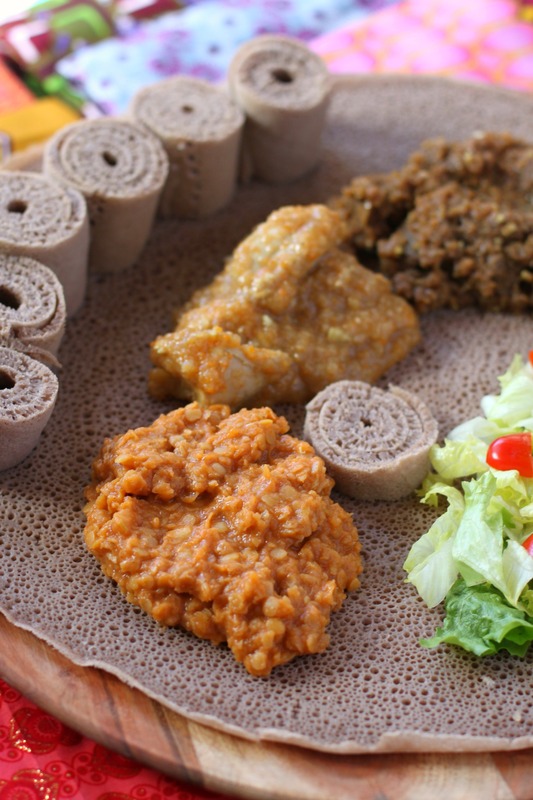 The flavour of traditional injera can be quite bitter and pronounced (and expensive), so many North American recipes call for a combination of flours instead of 100% teff. I managed to find some ground teff flour and watch some online videos which were all in Amharic, one of the most common languages spoken in Ethiopia. The recipes are also not very helpful because they aren’t very exact, as often these kind of cooking traditions are passed down orally and not written down at all. It’s important to note that the injera needs to be fermented for at least 4 days (you should smell my laundry room!) so it’s a project that takes time and effort. Once the batter is fully fermented, it is poured out onto a grill similar to making pancakes though it is only cooked on one side, leaving the other side to bubble and become full of holes. The finished product has a spongy texture, perfect for sopping up stew juices. 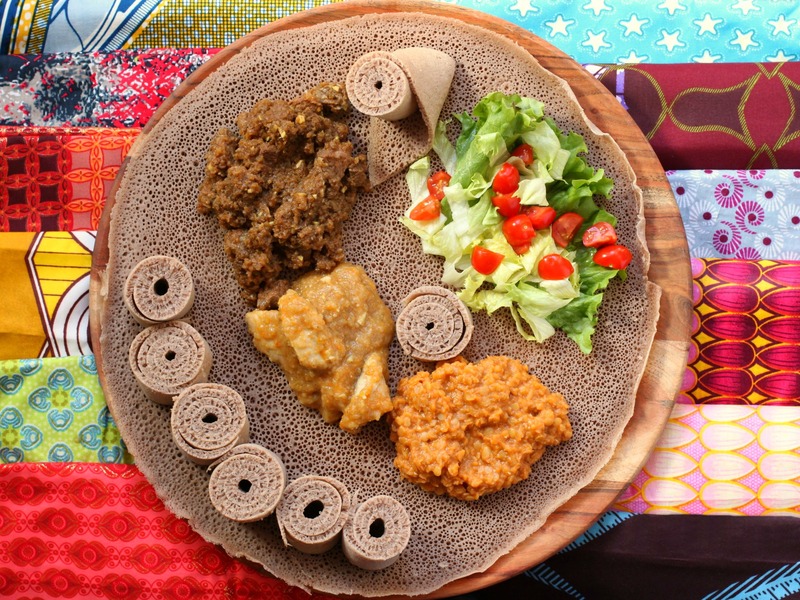 Traditionally there are no utensils at an Ethiopian table, only injera and the dinner is served family style on a central platter with everyone gathered together to enjoy the food. 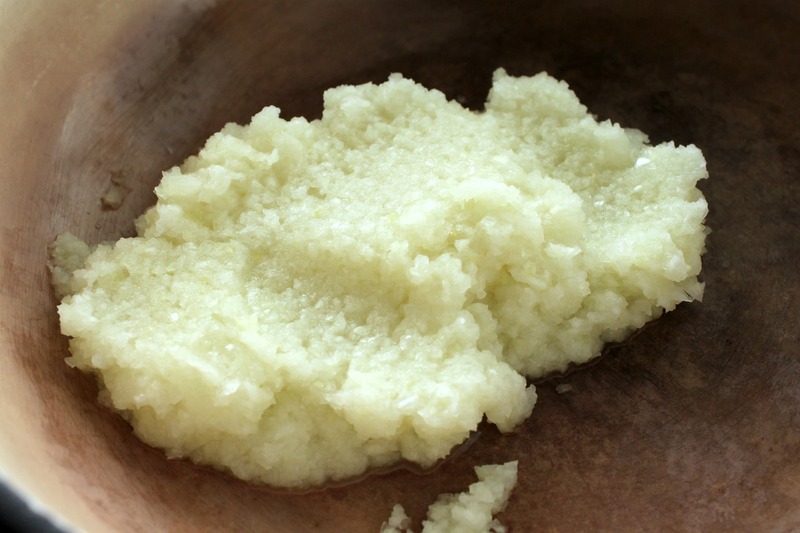 There are some interesting ingredients and techniques used in Ethiopian cooking, one being the use of spiced clarified butter, or Nit’ir Qibe as a finishing flavour. There is no definitive recipe for nit’ir qibe, it’s like the garam masala of Ethiopian cooking, with each family having their own version. I already had clarified butter (desi ghee) so I skipped a bit of time and just infused the clarified butter with added ingredients. I used a combination of spices from a recipe I found at food.com so it may not be traditional (or use authentic Ethiopian herbs like oregano, cardamom, etc.) but it sure turned out tasty. I cooked some rice in the rice cooker with a 1/4 tsp black nigella seeds, then finished it with a few tablespoons of nit’re qibe and it fabulous! Next, I learned that making an authentic (or as authentic as I know how to) Ethiopian wot doesn’t take a lot of ingredients, but it does take a lot of TIME. The amount of time that you spend on a recipe adds on to the flavour in an important way. Most wots begin with the slow cooking of onion purée because you know what else grows in Ethiopia? Onions. Most importantly, you need to know that Ethiopian food is DAMN spicy. I’ve been burned too many times (pun intended) with curry pastes, chili powders, amounts of peppers, etc. in other cuisines to not check the spice level of the ingredient that I’m going to use. Berbere is a mixture of spices including but not limited to chili peppers, garlic, ginger, basil, kararima, rue, ajwain or radhuni, nigella, and fenugreek, it looks spicy and it is fiery hot. Now, I like a bit of spice as much as the next person…red Thai curry, Korean kimchi, vindaloo, etc. but nothing prepared me for the raging inferno that overtook my tongue when I tried just the slightest dab of Berbere. There was no way in h-e- double hockey sticks that I was going to add 1/4 cup to the Doro Wat. I settled on a rounded tablespoon and we all agree that was a fair amount for our palates. Before you judge, head on down to your nearest Ethiopian ‘convenience store’ and give their house berbere blend a go. Typically the above pictured dishes would have a striking red colour due to the amount of berbere added, but they would have been so hot as to be inedible in my house. My favourite dish was the Misir Wot because I am always looking for new and interesting lentil dishes. I was also pretty intrigued by the Shiro Powder that I bought at the Ethiopian convenience store. 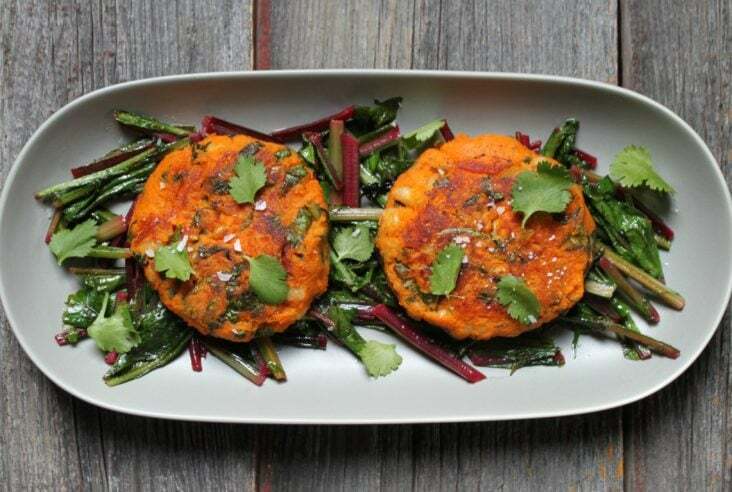 It’s made of peas, lentils, and chickpeas that are dried and ground into a fine powder and mixed with a combination of spices and herbs (fenugreek, cardamom, and sacred basil to name a few – as well as dried garlic and ginger). When mixed with onions, garlic, water, and some green peppers it becomes a dish on it’s own. I decided that I would add the Shiro powder to the lentils so that I could try both together. 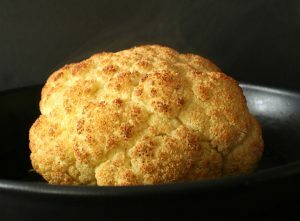 Without the nit’ir qibe as a finishing agent, it would make a great vegan dish for my daughter. I debated a bit as to how I was going to present my Ethiopian feast. There’s actually a small African convenience store very close to where I live, though it carries mostly Nigerian and Ghanian food stuffs and sundries. It does have a gorgeous selection of ‘African’ block print fabrics which are used to make traditional dresses for special occasions. The history of how these prints came to be popular in African culture is quite an interesting read, so if you have time head over to HERE and enjoy. At the store I waited for quite a while as the cashier performed various tasks for other customers, only to find out that each 6 metres of fabric cost upwards of $60. I couldn’t justify spending that amount on such a huge amount of fabric I only needed for an hour or two. It suddenly dawned on me that our Nigerian neighbours might have some and if they did, I felt sure they would let me borrow it for an afternoon. It turned out that Dee had a whole stack of gorgeous fabric and in the end I couldn’t decide which one to use so I used them all! I’m super excited to see what all the other Around the World in Twelve Plates participants did for the Ethiopian challenge. We all have our own unique ways of completing each month’s challenges. If you want to see what everyone else is up to, clink on the links below! Add all ingredients to a small pot. Heat until mixture maintains a slight simmer. Simmer for 15 minutes. Strain. Pulse onion in a food processor until it turns into a chunky purée. Sautée in medium sized pot with a few generous tablespoons of olive oil for about 4-5 minutes until onions are soft. Add finely minced garlic and Berbere then sautée for 4 more minutes taking care not to burn. Add in tomato paste spice and stir until mixed thoroughly. If mixture is too thick, add about 1/4 cup of water. Cook mixture another 2-3 minutes stirring occasionally. Place red lentils in a bowl and rinse thoroughly. Once rinsed, add 2.5 cups of fresh water to the bowl and add this to the onion and Berbere mixture. At medium heat, stirring occasionally, simmer until lentils are fully cooked – about 15 or 20 minutes. If mixture becomes dry before lentils are cooked, add small amounts of water to mixture until they are. Once you know that they are fully cooked, stir in about 1/2 of warm water. Salt to taste. 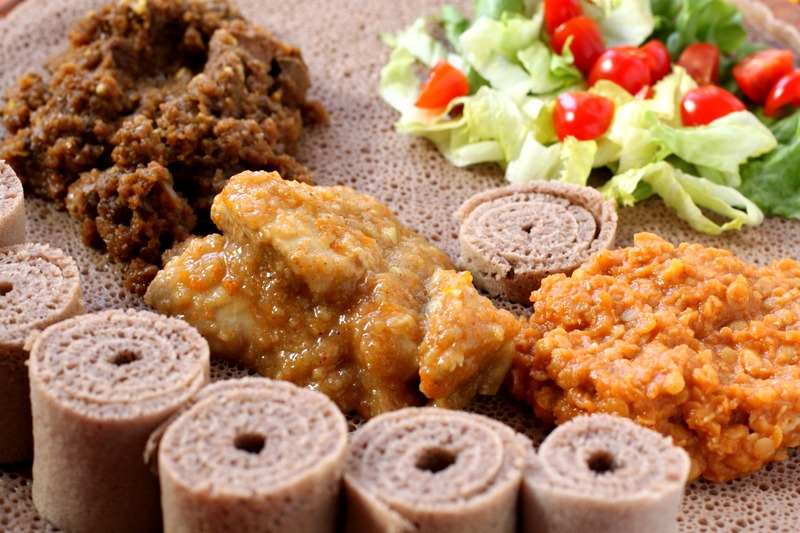 Serve hot with Injera on the side or over rice. ¼ cup berbere (taste it before you add 1/4 cup) I added 1 tbsp because I’m a wuss. Cut the chicken into 1 inch pieces, place in a bowl and pour lemon juice over all. Stir and let sit for 1/2 hour. Pulse onion in a food processor until it turns into a chunky purée. Heat the nit’ir qibe or butter along with the olive oil in a Dutch oven. Add the onions and saute, covered, over low heat for 45 minutes, stirring occasionally. Add the garlic, ginger, and 1 tablespoon butter and continue to sauté, covered, for another 20 minutes, stirring occasionally. Add the berbere and the 2 remaining tablespoons of butter and sauté, covered, over low heat for another 30 minutes, stirring occasionally. Add the chicken, broth, and wine and bring to a boil. Reduce the heat to low, cover, and simmer for 45 minutes, stirring occasionally. Adjust the seasonings, adding more berbere according to heat preference. Add the boiled eggs and simmer on low heat, covered, for another 15 minutes. Serve hot with injera or rice. Wash the cubed beef well, pat them dry with a towel, and set aside in the fridge. Add the onions to a food processor and process until you have a chunky purée. Transfer the onions to a heavy pot & cook on medium heat until they are soft and have turned a reddish-brown color. Add the water and berbere. Cook an additional 30 minutes, stirring periodically, adding more water if needed so the sauce doesn’t get dry (this process allows for the berbere to become less bitter). Add the meat to the sauce & turn the heat down to low. Simmer for 45 minutes to an hour, adding a little water, if needed, to prevent the onions and meat from sticking to the bottom of the pan. After an hour or so of simmering, add the butter, salt, garlic, and more water if the sauce is getting dry. Simmer another hour. If this is your first introduction to Ethiopian cuisine, I’m so happy for you. The flavors are so unique! I make my own Berber and niter kebbeh and sometimes use them in other dishes. Yes! I was really happy with the nit’ir qibe, definitely something I will make again. Discovered your post from Gabby’s! I love all of your photos. 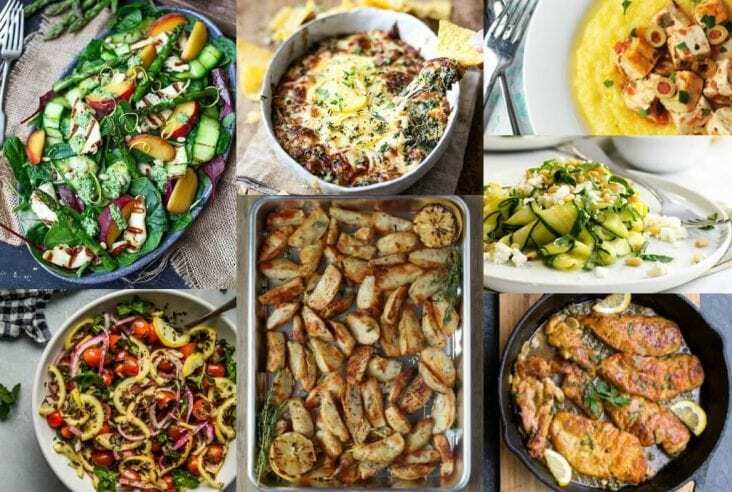 The meal turned out beautifully – I’d love to take on this challenge one day. Hi Alice! Thanks for stopping by. I love Gabby’s blog and this ATW12P project has been so fun and fulfilling. Ethiopia was my favourite month so far, I really love the flavours of the Shiro powder and have been using it in dishes ever since!